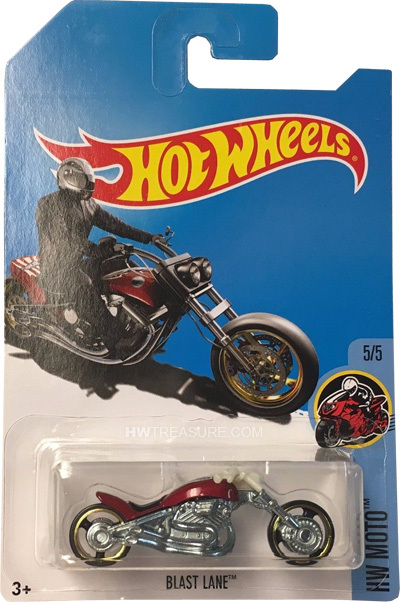 DVC90 is a 2017 Treasure Hunt and 5/5 in the HW Moto series. It is red with white stripes and the Hot Wheels logo on the back fender. The tank has a blue and white graphic with stars and the low production symbol. The handlebars are white and the seat is black. 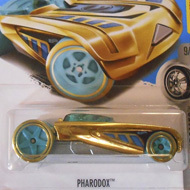 It has 3-spoke motorcycle wheels and an unpainted metal Malaysia base. 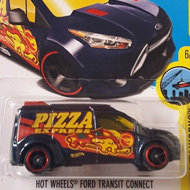 This vehicle can be found in mix “P” of 2017 Hot Wheels mainline cases. The Blast Lane made its debut in the 2000 First Editions series. It was previously a Treasure Hunt in 2001.